This Halloween, I am going to Fright Night at Thorpe Park with a few friends. We're all dressing up. 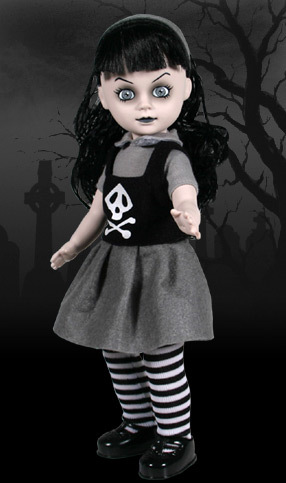 I'm going to be a creepy doll. Think porcelain and sweet, but also creepy. Pigtails (Large, perfect curls) tied with ribbons. No idea. Apart from knee-high socks. 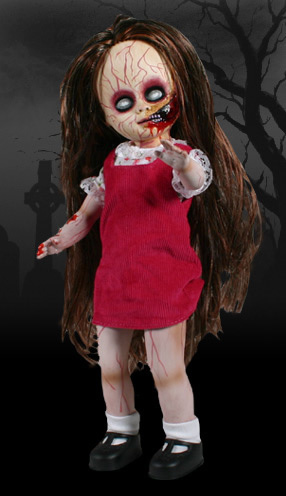 And also, how can I make it a bit creepier as this sounds more like a regular doll. I don't want to be obviously scary though (no blood or fangs or anything Although, if that's the only way, I could be persuaded), just that touch of creepiness. If you have other hair+makeup ideas, please share! Have you got like a short dress or anything or like a shirt with puff sleeves and short pleated skirt?? 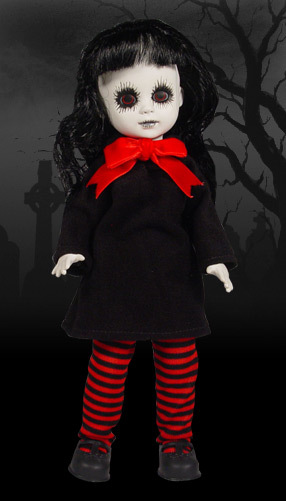 What about like a normail looking doll dress, but in a darker color like burgandy, then do that pretty dolly makeup, but with like stitches going across your face, kinda like Sally from Nightmare before christmas. 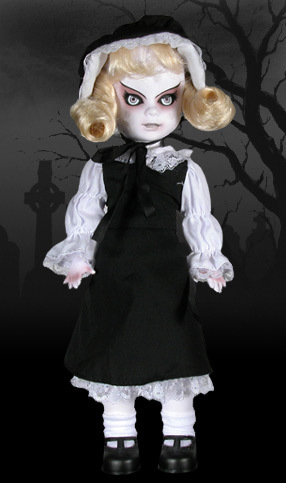 why not look at something like living dead dolls for inspiration? something with a collar like that would be cute. Ooh I love the puffy sleeved blouse. That would work well if I can get one because it looks a bit "gothic" but is also quite sweet cus of the puffiness and lace. I have a black top with a white collar (the one I wore to ice skating in the Friends photo thread) which could work, although I'd need to wear a skirt with that which may look a bit odd. Ahh I found the perfect dress but it's a size 12 damnit! Sewing girlies, how difficult dyou think this would be to resize? Would it just be a matter of turning it inside out and sewing the seams further in? Waa I love it so much. I'd wear it lots. And it's cheap. I don't think it would be too hard to take in. Just up the sides in the top half because the skirt is kinda a-line anyway. I looks like you can adjust the waist size by tying it behind your back. My only question is how much too big is it? If its way too big it starts to get harder to adjust because the shoulders won't fit right. I would vote a little jumper. With a blouse under it...? And tall socks and little mary janes? If the dress I get is above knee length I will most definitely wear long socks and mary janes. Actually, even if it's longer I can just roll them down a bit.. I need some help, these 3 auctions end around the same time and I'm not sure which one would work best for my costume? 1. Really nice, but I'm not sure.. not simple enough? 2. It's got a peter pan collar, by the way. 3. I think this would be really cute, and it would be warm! So, what dyou think, 1 2 or 3? It's lovellly plus very on trend for autumn/winter. I found some makeup inspiration for you girl franddd! when I saw it I thought of you right away! I'm doing that sort of lip. And ooh totally forgot about blusher! Will have to get some or see what my pink eyeshadows look like on teh cheeks. eee your gonna look so cute. i'm considering something like this (last minute costume making, not cool...) but i don't know! The thing I like about this idea is that it's quite flexible (I've changed my mind on what to wear for it so many times it must be : P) so it's perfect for a last minute thing. All I need now is knee high socks, not quite sure which colour I'll get.. probably purple? Oh and I don't know if I said this on another thread but I bought a quite angry looking little dark brown teddy bear to use as a prop. I'm putting a zippered pounch into the back for moneys. Carrying round more than one thing at Thorpe Park is annoying you see. 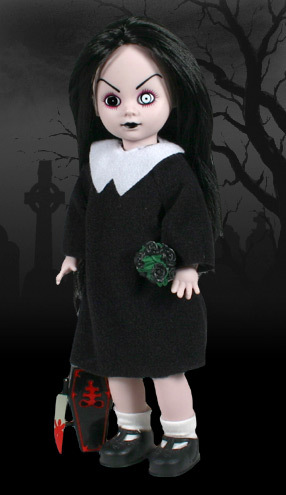 you should get white knee socks and black mary janes it would be so creepy dolll. ohh. haha. i didnt see that. soooorrryyy.